When protesters in Egypt began to fill Cairo’s Tahrir Square on January 25, 2011, and refused to leave until their demand that Hosni Mubarak step down was met, the politics of the region changed overnight. And the United States’ long friendship with the man who had ruled under emergency law for thirty years came starkly into question. From Franklin D. Roosevelt’s brief meeting with King Farouk near the end of World War II to Barack Obama’s 2009 speech in Cairo and the recent fall of Mubarak—the most significant turning point in American foreign policy since the end of the Cold War—this timely new book answers the urgent question of why Egypt has mattered so much to the United States. 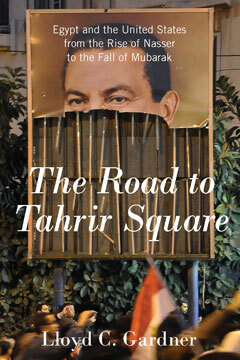 The Road to Tahrir Square is the first book to connect past and present, offering readers today an understanding of the events and forces determining American policy in this vitally important region. Making full use of the available records—including the controversial WikiLeaks archive—renowned historian Lloyd C. Gardner shows how the United States has sought to influence Egypt through economic aid, massive military assistance, and CIA manipulations, efforts that have immediate implications for how the current crisis will alter the balance of power in the Middle East. As millions of Americans ponder how the Egyptian revolution will change the face of the region and the world, here is both a fascinating story of past policies and an essential guide to possible futures.